Frustrated with your courtroom results? Discover the secrets for courtroom success here! Earlier this week I was in court for a motion hearing. Since I was early, I sat down and watched the hearing before mine. As you’ve heard me say before, any time you get the chance, I recommend watching other lawyers in action. If they’re better than you are, you’ll discover new skills or techniques you can apply to your practice. If they’re worse than you are, you’ll be reminded about mistakes that you shouldn’t repeat. No matter what happens, you’re almost guaranteed to learn something. Defense: You were submitting to the authority of the police, weren’t you? Defense: The police surrounded you, right? Defense: You didn’t have any choice but to do what they said, did you? Defense: Didn’t you feel obligated to do what the police told you? Judge: Sustained. Counselor, stop suggesting the answers to your witness and ask a non-leading question! Her case was falling apart before our very eyes. The witness was becoming disoriented, because he wasn’t allowed to answer any of the questions. The prosecutor was successfully objecting to every question. The judge was losing patience with the attorney’s inability (or unwillingness) to ask a proper question. The attorney was getting exasperated because she simply didn’t know what else to do. It was painful to watch. If you ever find yourself trapped in the same spot, you’ll need to break out of the rut and start asking proper questions. A question is ?Leading? when it suggests the answer to the witness or contains the information that you’re looking for. The best way to avoid asking leading questions during direct examination is ensure your questions start with one of Rudyard Kipling’s ?honest serving men:? and How and Where and Who. Remember, your goal on direct examination is to make the witness the star of the show. Whenever you ask leading questions, you shift the focus away from the witness and towards yourself. You aren’t the one testifying. The jury doesn’t want to hear from you — they want to hear from the witness. Make sure that you start each of your questions with any of these ?magic? words, and you’ll avoid 99% of all ?Leading? objections. Comments policy: Be cool. Uncool things (infantile comments, racist crap, spam links, etc) will be removed. Frustrated with Your Courtroom Results? If you're like most of my readers, you're committed to winning in the courtroom. 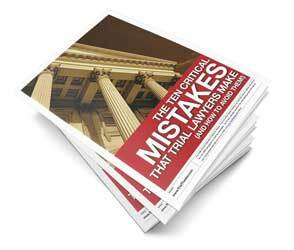 But the truth is, even experienced trial lawyers make mistakes in the courtroom that sabotage their client's cases. What trial skills would you like to learn?